1. Recommend to open in US country: $5/month plan, included 100 min Call / 100 MB / 100 SMS,SIM Card not included. 2. 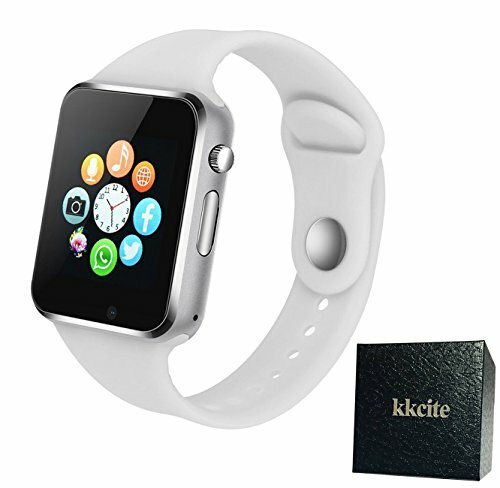 This kkcite smartwatch its used worldwide unlocked, but make sure the bluetooth its V3.0. All functions support android 4.3 and up smart phones.But for iphone, it support answer & call, phone book, music play, pedometer, phone anti-lost alert, radio, sleep monitoring, etc. But not support SMS(with SIM card can be), remote camera control. 3. Two ways you can choosed: Bluetooth mode as a parter of your phone. 2nd. Insert micro sim card as a Phone. 4. IOS system phone cant scan QR code,SIM Card not included. 5. Language: Support English, Russian, Spanish, Polish, Turkish, Italian, French, Germany, Portuguese. 6. This watch does not have GPS positioning function, NO WIFI function/No video function/only support 2G GSM. 1.Please open the rear cover and put the battery into the base according to the arrow of direction mark. 2.The watch mode is automatically set into company mode/flight mode. Please change it into normal mode and you can make calls, use network, ect. -BT V3.0Support Pedometer, Anti-Theft Etc. 【Muti-Function】The kkcite watch SIM or Bluetooth optional, Music playing, Alarm clock, Muti-timezone, Muti-language, Notification push including facebook, Twitter, Passometer, Sleep Tracker, Message Reminder, Call Reminder, Answer Call, Dial Call, Remote Control, Push Message. 【Network Mode】You can Install GSM 2G SIM card, it can be use as a phone. Please make sure you have a postpaid sim card, GSM 850/900/1800/1900 MHz, Single Micro SIM Card. 【Innovative Design and Durable】The smart watch has a 1.54" TFT LCD 2.5D Radian Capacitive Touch Screen 240*240 pixels, OGS Laminating Process and guarantee the durability of the smartwatch. Adjustable watch strap to any size length you want to fit your wrist. Best companion in daily time and outdoor sports activity. 【Comfortable and Health Management & Lifetime Warranty】Our smart watch is super light and comfortable, precision laminating process. Sport Pedometer, Sleep Monitor, Sedentary Reminder Assistant, help you record all day activities. Apart from this, we provide Lifetime Worry-Free product guarantee which ensure long-lasting enjoyment of your smart watch. If you have any questions about this product by kkcite, contact us by completing and submitting the form below. If you are looking for a specif part number, please include it with your message.